Register now for Movement Forward: 50 Years of Asian Americans in the Media happening this Thursday 9/27 starting 5:30 pm at the Chinese Cultural Center! This free town hall event celebrates the achievements of many foundational pioneers of Asian American media with appearances from 9 time Emmy award winning Emerald Yeh, former Senior Editor of Rolling Stones magazine Ben Fong-Torres, former host of NPR’s “All Things Considered” Emil Guillermo and many more. These Asian American media icons will be in conversation on how ethnic media progressed from a dire lack of representation to the current wealth of Asian American stories across today’s media landscape. They will also be discussing the troubling trend of untrustworthy news or “fake news” that has complicated the relationship between news source and reader. Chinese for Affirmative Action is proud to put on this community gathering of Asian Asian media pioneers and kicks off the start of CAA50: Movement Forward, a year long celebration of CAA’s past, present, and future. 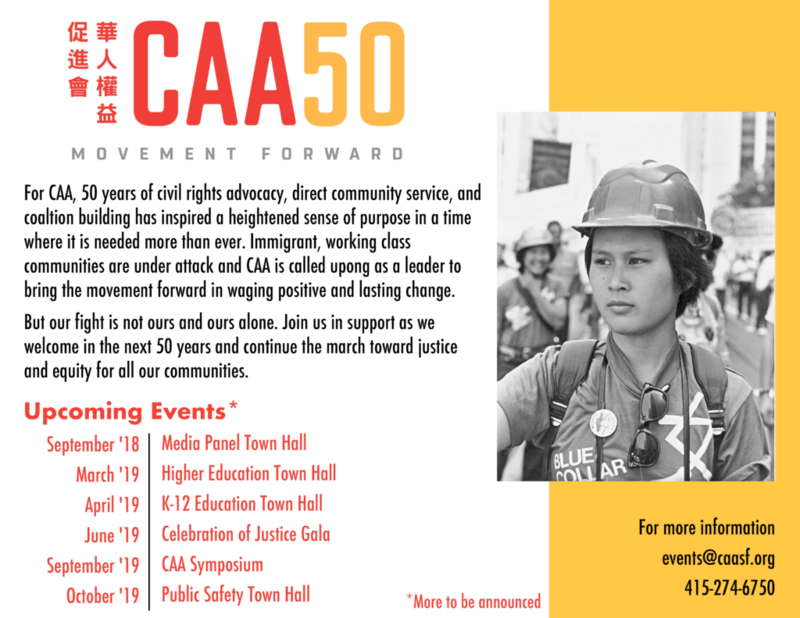 In the past 50 years, CAA has emerged as a leader in the fight for social justice and civil rights working to push the needle on progressive causes for communities of color. We are also looking toward the future. You can join us for many more events throughout 2018 and 2019 exploring the fight for civil rights across issue areas core to CAA’s mission. From higher education to public safety, stay in touch for more information soon.